I have had a wonderful week away. Vancouver has been glorious, with only a wee bit of rain last night. Quadra Island was spectacular. Jacey Boggs was inspiring and just plain swell. I had a marvellous visit with my kids, and with new friends Liz and Mark. But none of that is why I blog this morning. Instead, I want to share a story of Tragedy turned upside-down by Great Kindness. Once upon a time, not so very long ago, an Intrepid Spinner packed her bags for a workshop. This Spinner travels a bit, so she has a pretty reliable system for ensuring that her tools and equipment arrive at the other end safely. She also really likes to fly with one particular airline within Canada because they have always been good to her. This airline is Westjet. Her niddy-noddy, the second fibre tool she had ever purchased, waaay back when she was a Fledgling Spinner...DESTROYED. "Aaaaaaagggghhhh! @Westjet broke my niddy-noddy!" "What is a niddy-noddy, and how can we help?" "#Vancouver we need your help. Please let @spindleprincess know if you can help her find a niddy-noddy by noon tomorrow"
They even added the Wikipedia link so Vancouver would know what a niddy-noddy was. Within minutes, the Spinner was deluged with responses. 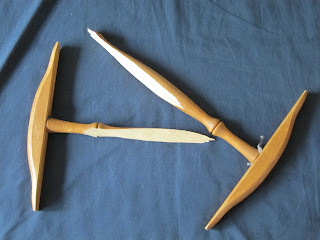 A loaned niddy-noddy was arranged, and a replacement put on hold for when the Spinner could pick it up. All was well. Then Westjet showed their true colors. They have offered to pay for the replacement niddy-noddy. They have checked in with the Spinner several times to ensure that all is well. They are being AWESOME. So, thank you Westjet for your Great Kindness. The Spinner will be travelling back to her home in the North tomorrow, and can hardly wait to fly Westjet again. Any chance we can get WestJet to take over the major airlines within the US?